What can you say about this, it sort of appeared very suddenly more or less a few months after I had completly given up hope of ever seeing it on the iPhone platform and my initial reaction has been one of disappointment, if I am going to be honest. Firstly, and I know it is a bit trivial, but what happened to the classic ListPro icon that we all knew and loved on our Palm and Windows Mobile devices? That wishy washy new one just doesn’t look right, it doesn’t stand out and it just doesn’t scream “ListPro”. It’s a bit bland in my view. The UI too is not ListPro, I find it a bit tricky to use and it’s a heck of a lot different to how it looks and behaves on Palm devices, the font is too small in most of the list views and when you touch on an item in a list it gets highlighted blue but does not take you to the actual item, you have to touch the arrow to the right instead which seems a bit odd. It’s great that it is finally available and it is great that it is free and the fact that you can sync your existing ListPro files via the Windows PC application is another whopping great advantage but I’d just like it to look and act a bit more like the Palm and WM version. This is obviously an early version so alterations/improvements may come but until then I’ll probably just stick with Tap Forms which has a bit more eye candy and a wide range of settings and customisations. I’d be interested though to see what others, who used ListPro on Palm, think of the new version as it could well be just me. Initial reviews for ListPro have been very positive on the App Store, which is good. Murray – few posts/tweets from you lately about the size of fonts in apps. Eye test time maybe? I was never a Palm List Pro user, but knew you were. I loaded this straight away. Having no previous LP baggage, I think it’s OK – clean, tidy and one of the better apps around. However, I’ve already relegated it to the not to be regularly used pile, as I’ve rediscovered ToDo by Appigo, something I tried a year or so ago and then gave up on. 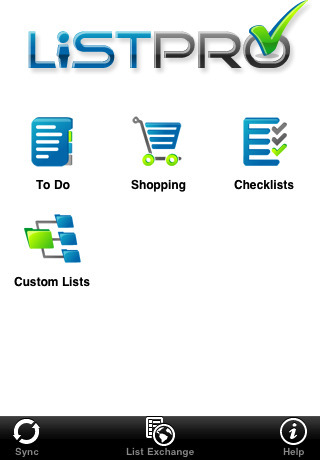 Not strictly a list app, though it does offer checklists. I think it’s very good and I’m putting more effort into this app than I have with any other ToDo app on the iPhone so far.